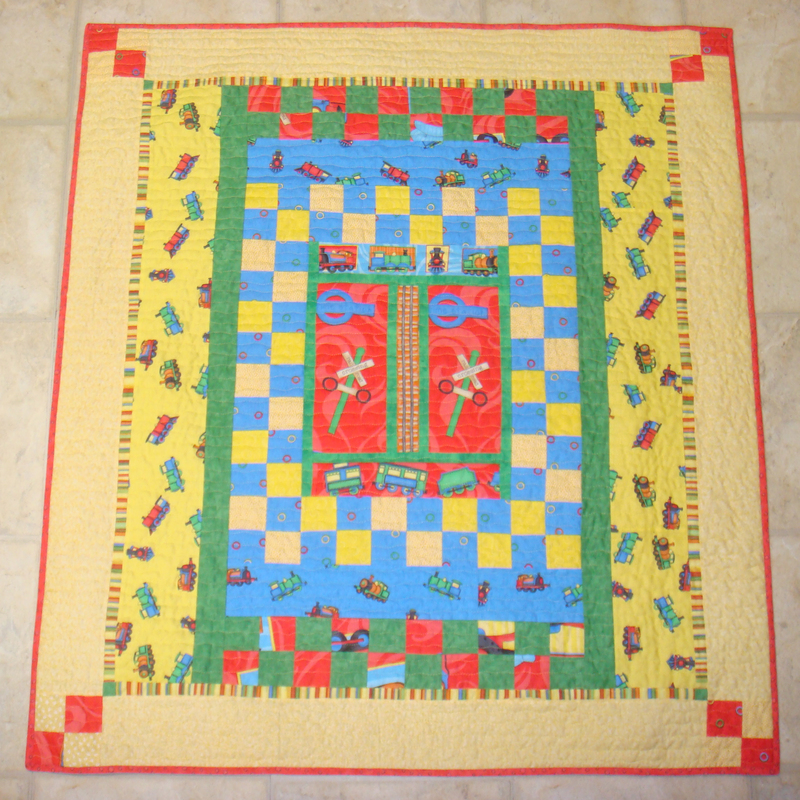 The 38″ by 42″ baby-sized scrap quilt is the surprising result of a bag of quilt-shop scraps. It looks like a coordinated, planned quilt, but it is a scrap quilt in the true sense of the term! When I attended a conference in 2007 in Victoria, British Colombia, I made time to visit Satin Moon Quilt Shop (on Government Street near Chinatown (1689 Government Street, Victoria BC, phone 1-800-345-3811, http://www.satin-moon.com. ) I loved the vibrant and charming store, especially the large selection on Asian prints. Just as I was taking my purchases to the counter, I noticed a basket of bagged scraps and quickly selected one that appeared to have mainly blue and yellow scraps that would fit in well with a scrap star quilt that was then on my design wall. I surmise that the scraps were remnants from classes and shop samples. All of the scrap fabric was excellent quality. When I sorted through the scraps, separating out the desired blues and yellows for my star quilt, another group of other scraps surfaced that appeared to be from a train-themed line of fabrics. No selvedges were intact, so I have no idea which company or designer. The pile of coordinating scraps was big enough that I wondered if I could make anything with them. I mulled it over for a few years, and put the idea on my “someday” list, while the scraps patiently waited in their ziploc bag. In my effort to clean up my backlog of UFOs (Unfinished Objects) and WIPs (Works in Progress), I gave myself the challenge of making a baby quilt using those scraps. This quilt is the result of that personal challenge. During the summer of 2011 while on vacation in Northern Ontario, I completed the center of the flimsie. With only the bag of fabric on hand and no stash to raid, this quilt required a great deal of pondering time, trying various options to make it work. With no fabric to waste and none to re-cut if I made mistakes, my measuring tools got a good work-out before I cut anything! Every single scrap was used in the quilt, with less than a tablespoon of trimmed edges remaining from that original pile of scraps! When I returned from vacation, I added the wide light yellow border from my stash. The rest of the top came from that purchased bag of scraps. It is MUCH easier to design a quilt with a large supply of fabric, but limitations placed on us by available resources available sparks more creative thinking than we might expect. Design challenges are much more intriguing. The satisfaction that comes from successfully conquering a design challenge is much greater than making a quilt with unlimited resources! I am very pleased with this quilt. The top was quilted using a yellow cotton-wrapped poly thread in a wiggly horizontal line, reminiscent of the path that train tracks take. It is simple, easy and very effective on this quilt. Both the backing and the binding came from stash. The binding was was attached to the back and top-stitched by machine to the front of the quilt, a method I prefer to ensure durability on often-washed baby quilts. Goal Status: 39 projects complete and 13 more to go to reach my goal of 52 projects finished by Dec 31st. This entry was posted in Completed Quilt Project and tagged Baby quilt, Design Challenge, Left over fabrics, Scrap Quilt. Bookmark the permalink.